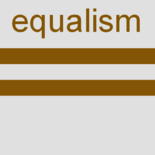 At a face-to-face level, equalism works through conversation. Conversation thrives on difference. But it is hardest when you’re in most disagreement. How do we do respectful talking across differences of belief … especially extreme differences? If we knew how to do that, happier connection, diversity and liberation would be the reward. Ex-extremist Megan Phelps-Roper has done this. Astonishingly, she’s even had liberating conversations on Twitter! She says: It’s simple but it’s hard to do. She says four things help: Don’t assume bad intent. Ask questions. Stay calm. Make the argument. Megan Phelps-Roper grew up in the aggressively righteous placard-waving Westboro Baptist Church. As a young adult she took her cause onto Twitter. Surprisingly, there she ended up more moderate and tolerant, not more extreme. She made friends. She made the huge decision to leave the church and her family. We usually think of the internet’s social media as a great way to escalate and polarise people’s heated differences. We do not expect the likes of Twitter to create constructive discussion let alone agreement. Watch Megan’s TED talk to discover how some people’s Tweets converted her from her extremism. With just 140-characters per Tweet, she discovered that outsiders were not the evil types her church had taught her they were. So remember this surprising fact: Tweets can escalate extreme differences. But they can also work against extremism. And also remember how: Don’t assume bad intent. Ask questions. Stay calm. Make the argument. Watch her tell her story and what she learned in her TED talk. Her message is powerful and convincing … even if you read the text on its own without her engaging and attractive personality to persuade you! A colleague who knows about cults confirms that the Westboro Baptist Church is well known for its fully fledged cultic qualities. Cults make very sure that people don’t have freedom within the cult and outside the cult to talk freely to other people. They don’t want the critical thinking to have a chance to develop. Alex Stein in “Terror, Love and Brainwashing” calls the outside contacts “escape hatches” that the cult normally makes sure are kept well and truly battened down. My colleague guesses that this cult didn’t realise that Megan’s use of Twitter – a loyal member looking to promote the cult’s cause using new social media – would risk an “escape hatch” opening up as it did for her. My colleague is pretty certain that the cult will since have battened down a new rule that prevents members using social media like Megan did. This entry was posted on 1 May 2017 by Nick Child in Equalism in general, Race, Religion, Sexuality and tagged Conversation, Equalism, Family Conlict, Free Speech, Religion.